Some of our personal hygiene practices have some dirty side effects for the environment. Plastic microbeads became a common ingredient in facial washes, scrubs, toothpastes, and soaps several years ago. They were added as a cheap ingredient to exfoliate the skin or buff teeth. The scientific community became aware of them around 2012 when a study was released from SUNY Fredonia showing high concentrations of plastic microbeads in the Great Lakes. They further caught public scrutiny when dentists reported removing microbeads from patients gums, where they caused irritation. 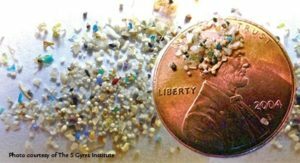 Microbeads that were recovered from the Great Lakes are shown to scale. Plastic microbeads are so small (5mm or smaller) that most are not filtered out of the water after it goes down the drain. In our waterways, they can absorb toxins and are mistakenly eaten as food by marine life. From there, they migrate up the food chain and have been found in the seafood we eat. A 2015 study published in Environmental Science & Technology found that about 8 trillion microbeads enter waterways every day in the United States. Fortunately, that figure should start to go down. Jen Walling, executive director of the Illinois Environmental Council, (right of sign) poses for a celebratory photo with supporters in front of Lake Michigan after the Illinois microbead ban was passed. 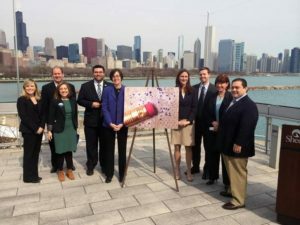 SCARCE collaborated with the Illinois Environmental Council (IEC) to draft state legislation to ban plastic microbeads in Illinois. Thanks to the hard work of Jen Walling, executive director of the IEC, to get legislative and industry support, Illinois became the first state to ban microbeads. The Microbead-free Waters Act was signed into law by former Governor Pat Quinn in June 2014. 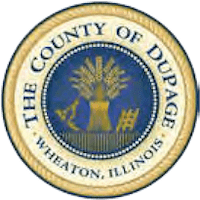 The law takes effect starting December 31st, 2017 with a phase-out continuing through the end of 2019. Thanks in part to Illinois taking the initiative, a handful of other states have passed bans including Minnesota, Maryland, Indiana, and California. This prompted a federal ban on microbeads in rinse-off personal care products to be passed in December 2015. It begins to phase out microbeads July 1st, 2017. Many companies have already begun to remove plastic microbeads from their products and reformulate them in anticipation of the microbead ban deadlines and due to customer concerns. There is still work to do. Neither the Illinois law nor the federal law ban so called “biodegradable” plastic microbeads nor do they cover products such as detergents and cosmetics that are left on the skin (i.e. not rinsed off – immediately, that is). According to a Time interview, Walling said it “was a cooperative effort with the industry in order to address our and their concerns. In the end, we were trying to get something that would pass. Other states should try for more stringent standards.” California’s microbead law is the most stringent and is the only one to include biodegradable microbeads under the ban. 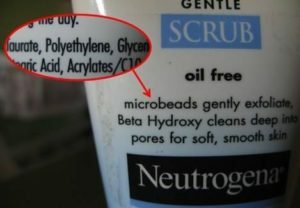 Avoid products containing plastic microbeads. Take a look at ingredients lists, both “active” and “inactive” sections. 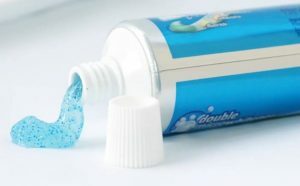 The keywords for “plastic microbeads” are polyethylene, polypropylene, polylactic acid (PLA), polyethylene terephthalate or polymethyl methacrylate. If you see those in the list, stop using the product and don’t buy it again! Fortunately, that doesn’t mean you have to go without. Natural exfoliants have been around for centuries! Examples include pumice, oatmeal, coffee grounds, ground apricot pits and even walnut shells. There are a number of more natural brands out there that have never used plastic in their products, such as Burt’s Bees, and other mainstream brands will hopefully make the shift. You could even make your own scrub at home with things found in your pantry. 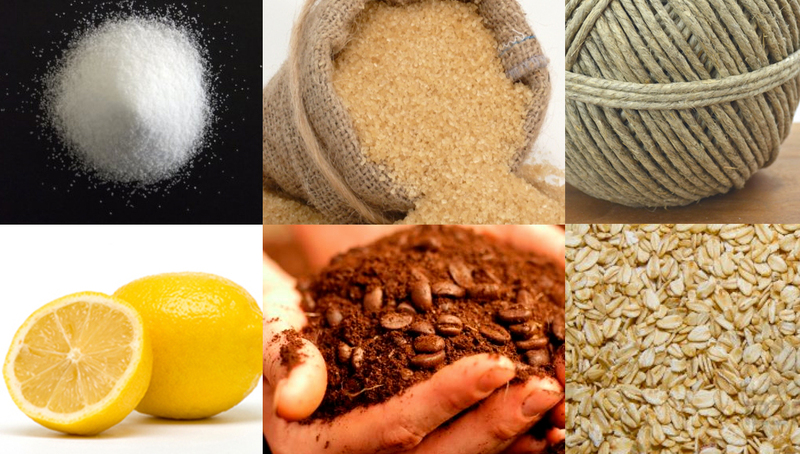 Some natural alternatives to microbeads: baking soda, lemon, hemp, sugar, coffee, and oatmeal. Microbeads are only one piece of the plastic pollution puzzle. There are many sources of plastic pollution – some of which is straight up littered and the rest that wiggles it’s way out of our waste stream. You can take steps to help address the plastic problem and prevent disposable plastics entering the Great Lakes and our rivers, streams, and oceans.